An easy recipe to make pumpkin pie from a pumpkin, plus how to roast flavorful pumpkin seeds! I was at a farm stand in Gardiner one fall day and saw perfect pie pumpkins. Before then, I’d never attempted to make a pumpkin pie, even from canned pumpkin. But I thought, I’ve got cookbooks and the Internet, how hard can it be? Well… It took a lot of trial and error. From soupy pumpkin concoctions that never quite turned into pie, to perfecting the texture and color of a pie only to realize I forgot to add sugar (mleh)… I made plenty of mistakes before nailing it with this recipe I put together from my learnings. If you’ve made pumpkin pie from a can before, you know it’s pretty simple to make a delicious fall dessert fast. This one takes a little more work, but in the end, it’s so worth the time. I like to suggest making a weekend of it: spend the first day going to the farm stand or pumpkin patch to get a fresh pumpkin and, if they offer it, pumpkin spices. The next day you’ll have everything you need to jump right in; just add some great music to help pass the time! Please note, this post contains affiliate links. When selecting a sugar pumpkin, keep in mind that the greener the stem, the fresher the pumpkin. Choose one that’s not too small, but rather a smallish medium — you’ll want to glean two cups of pumpkinny goodness, so if your options are very tiny, grab two! It’s helpful to have the following kitchen items on-hand. I’ve included quick links in case you’re in the market to buy. Pie Dish — if you plan to make a crust. Otherwise, pre-crusted pans are fine. First, you’ll need to cut your sugar pumpkin in half around its equator. This can be difficult since pumpkins are round (and knives are sharp! ), so use caution. 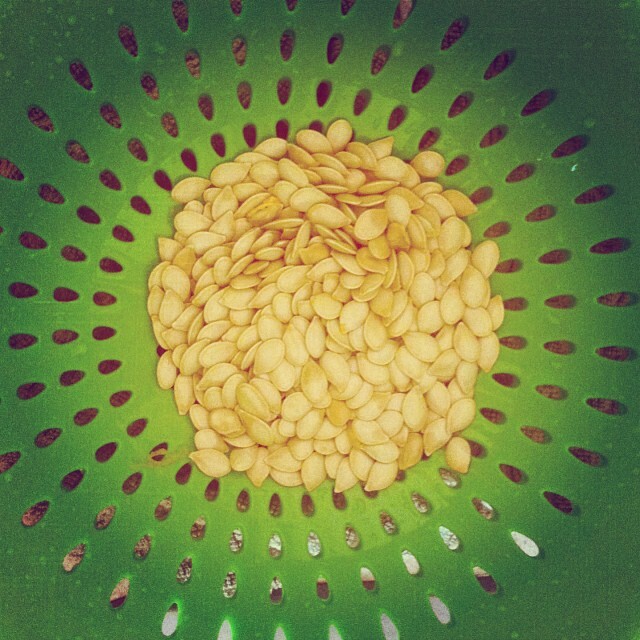 When you have two separate halves, pull out the pumpkin seeds by hand and set them aside in a colander. Using a tablespoon, remove any lingering seeds or stringy pulp. (Discard the pulp.) Rub a little olive oil on the outside of the pumpkin and around the edges before placing the hollow side down on a baking sheet. Bake in a preheated 350º oven for about an hour; you’ll know it’s done when you can poke a fork through the thickest part of the pumpkin. When the pumpkin is pokeable, remove the baking sheet from the oven, but leave the oven on at 400º. After allowing the halves to cool, scoop out the softened orange pumpkinmush (an ice cream scoop works well) and place right into a 2C measuring cup to ensure you have the right amount, before transferring into a large mixing bowl. Traditional: Sprinkle sea salt over the seeds. Savory: Sprinkle sea salt, black pepper, and onion powder over the seeds. Latin: Sprinkle Adobo, with reckless abandon. Spicy: Sprinkle sea salt, a teeny bit of cayenne, and a squeeze of lime juice. Bake at 400º for about 10 minutes, or until they are a golden brown. Set aside in a bowl for guests who pop into the kitchen hungry once they begin to smell the pie baking. Okay. You’ve already put some quality time into the kitchen at this point, and you might want to chat with company, take the dog for a walk, or just take a break from the oven. And that’s fine. Use a 9-in premade graham cracker crust. I won’t tell. Let’s get crazy and make our own crust out of — get ready — animal crackers! I recommend Barbara’s vanilla-flavored Snackimals. Blend the Snackimals in a food processor — if you don’t have a food processor, you could try a blender, but might have to break up small chunks by hand until you have a powder. Mix in a bowl with other ingredients, kneading with your hands, and adding more flour or a few drops of water if needed to maintain a doughy consistency. Press dough evenly into a 9-in. pie dish and poke a few fork holes into the bottom. Bake in the still 400º oven for about 10 minutes. Remove and allow the crust to cool while you prepare the pie mix. Turn the oven up to 425º. Note: Sub 2 teaspoons of pumpkin pie spice instead of the cinnamon, cloves, allspice and ginger, if you prefer. Mix well using an immersion blender or hand mixer and pour into pie crust. If your crust comes up over the pie, put a little foil on it to prevent over cooking the edges. Place pie on the middle rack and bake for about 15 minutes at 425º, and then lower to 350º to bake for another 45-60 minutes, or until a knife dipped in the center comes out clean. (Depending on your oven, it might take longer.) Remove from oven and let cool on a wire rack.